Tell us a little about your most recent find. What was the first sighting of what you called Homo sapiens edaltu? I gather that the meaning of this find took many years to unravel. We go back to 1996, when you saw something which began this long process. Tell us a little about that, and then we'll look at the specimen. In '96 we were out on a peninsula, called the Bouri Peninsula, where a bend of the Awash River goes around a long finger of land. 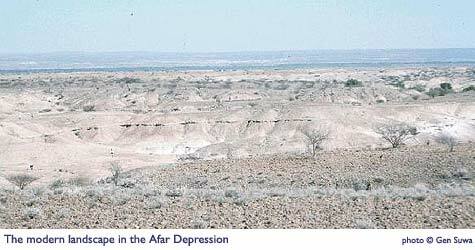 The Afar people have two major villages on this finger of land: one is Herto, one is Bouri. 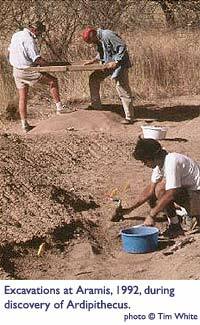 We had been working around Bouri with Desmond Clark, who had done a lot of work on the hand-axes. We had never found any human remains in these deposits. So at the end of the '96 season we were a little bit disappointed, and we came home and planned for '97. In '97, we went out, but it was an El Niño year, so although we could drive to the edge of the asphalt, we couldn't go into the Afar, because everything gets muddy and all the rivers are full, you can't move. It took about three weeks. We finally got out, set our field camp out there on the Bouri Peninsula. We went out the first day; we drove past Bouri Village out to Herto Village, which was abandoned, not a soul around. These people are nomadic pastoralists, so they take their cows and their camels and their goats, and they move on to where the grass is, and they had moved on. That was a good thing, because around a village you have hundreds of people, and there's a lot of livestock and dust and animal dung. But Herto Village is right on top of a very important archeological site. It had been raining, so the ground was very clean. We pulled the car off, and I saw a hippopotamus cranium just emerging -- not a recent one, a fossil one -- with stone tools. And so we thought, "This is great. Let's come back here." We got a chance to go back a couple of weeks later because we had to take a French colleague out. By then it had rained again, and we were cut off. Dr. Berhane and the logistical crew were up on the highlands -- they couldn't get in and we couldn't get out. This guy had to go back to France, or he was going to lose his job, and I said, "Well, the way you get back is, you swim across the Awash River, you walk for five miles, you flag down a truck, and hopefully you get back to Addis Ababa." And so he did, and we took him out there. We had a little time left in the morning, so we went up, set a fly next to our car. It was really hot out there. We established this lunch shade, and the students ... you know, everybody likes to be in the shade at 11 o'clock, because the temperature is about 110°, but I said, "No, no, no, it's not time for lunch. Go and survey a little bit." Two of the guys went out, and they found pieces of human cranium. They came back; they were quite excited. So we had lunch, went out. Graduate students started brushing away [the dirt] and putting flags in, and we saw the outline of a human cranium in the sand. It was just eroding out. You want to find the fossils just as they come out, before they shatter and scatter. So we found this adult cranium, and it was -- [holding modern skull] if you can imagine with our human skull, it was on its side, in fact, it's right side was down. It had been buried that way, we later found out, 160,000 years ago. We didn't know it at the time; that was still geological work to do. It had all been broken, and so we took it out of the ground, and we eventually removed the whole encasing sand and fossil in a plaster jacket holding everything together. We took it to the laboratory in Addis Ababa. This is the sand, a little bit of the sand; we made a cast of the thing in Addis. This is a cast of the bottom of the cranium. It took years to clean each grain of sand away from the bone. The bone is very soft; you have to preserve it as you go. 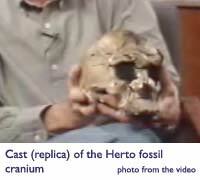 At the end of that process, we had this cranium of a man who lived in the Afar 160,000 years ago. Now, this is a very important time period in Africa, and until this discovery, a very poorly known time period. It derives its importance from genetic studies that have been done here at Berkeley starting in the 1980s. These genetic studies came up with very big surprises about modern humans. If you sample the mitochondrial DNA of people around the world, whether it's Australia, Scandinavia, wherever you want to do it, it turns out the human species has a very small amount of total genetic variation compared to other species. The chimpanzees have more genetic variation than humans -- it's a surprising find. The biochemists here at Berkeley, particularly Alan Wilson and Rebecca Cann, said, "You know what? The most diversity is in Africa. Even though there's limited diversity, most of it is African. We ought to be looking there for modern human origins, the origins of anatomically modern people." Why do you say that there's more diversity in Africa? What do you mean? You can measure how much variation there is in the mitochondrial DNA. Africans are all across the human spread -- Europeans are here, Asians are here, but there's a lot of diversity among Africans, suggesting that the common maternal ancestor was an African woman who lived around 100,000 to 200,000 years ago. Now, of course, the genetic data can tell you about relationships, but they can't tell you what she looked like or what her mate looked like, what the other people looked like, what they were doing, where they lived, and so on and so forth. For that you need a record, you need to go through that geological record, and hope that you can find the remains. This new discovery from Herto has done exactly that. It's opened up a window at 160,000 years ago in Africa. And it's opened up a real contrast, because we've had a pretty good European record until now. The European record shows us that at 155,000, 160,000 years ago, Europe (and North America, for that matter, but there were no people in North America then -- they were all Old World until very recently) -- [had] big continental glaciers. It was refrigerated, and there were people there who are called Neanderthals. They've been known since the 1800s, and their place in human evolution has always been a mystery. People have argued that they are ancestors; other people have argued that they're not ancestors. So, a huge controversy. But Africa remained a place where we didn't have a good look at that time period, and so the Herto discoveries suddenly constitute a flood of new data. The data are geological, the dating; the sedimentology, telling us about the environment; the archeology, telling us about the behavior; the fauna, telling us about what kind of animals were around; and the human remains themselves, telling us what those people looked like. This is the perfect team to study all of these data, because we have the geologists, the paleontologists, the stratigraphers, the archeologists -- everybody is there. We started to work on this in '97, and we just published it last June. It's about a five- to six-year period where all of these analysts have now done their job, pulled the data together, and this has been published. So what does it tell us? What was Africa like? What were these people doing? We know about the environment. It was a tropical environment, much like an African game park today. They were on the edge of a freshwater lake. They were engaged in butchering hippopotamus. How do we know? We found the hippo bones, the butchery marks on those bones, where they broke the bones open, where they cut the meat off. We found the stone tools that these people were making -- very sophisticated tools of obsidian, in fact. Now, what about the other organisms around? Well, we have remains of extinct mammals, large buffalo that have since gone extinct. We have the ancestors of other African mammals today -- giraffes, for example. And what about that other peculiar mammal, the human being? Well, we have their remains as well. We have that adult cranium, and we found the cranium of a six- to seven-year-old child. We have not only the setting, we have all of the actors in the form of the animals and the people, and so we can understand a lot about that world of 160,000 years ago. When we look at the anatomy, we find that these people are not at all like Neanderthals. In fact, they have features in their faces, in particular, that establish a very tight relationship [to modern humans]. They are not exactly completely modern, but they are just ... remember we needed to take that one step? Now, we've taken the step with this new fossil. We are able to step back from the modern human 160,000 years into the past and say, "What are the features that are shared? What are the ones that are different?" What we see in the fossil is something that is an evolutionary intermediate between earlier African populations that we've managed to find and modern African people. And so it looks like this is the ancestor of that limited genetic diversity that we see among all people today, that late in human evolutionary history, an individual looking very much like this adult male from Herto would have been ancestral to the people of the world. Now, do you find in this exploration that the changes in the anatomy [parallel] changes in the technology, the tools that they were using? Yes, of course, the objective of all of this research is not just to take one step into the past, but to understand the process, to take as many steps as we can, indeed, to open as many windows on the past as is possible. In this one study area, we've opened up a whole series of windows. We can go back to a window we opened on two and a half million years ago -- this happened about the same time, about '97, when we found, in sediments dated to two and a half [million years ago], evidence of the very first butchery of animals -- the very most primitive stone tools -- not well-shaped tools, not tools out of obsidian; just rocks that were broken to get a sharp edge. We found the remains of human ancestors, with much smaller brains, much more projecting faces. They weren't chimpanzees; chimpanzees don't do these kinds of behaviors, but these behaviors were probably critically important at another [earlier] stage of the human career. These are organisms -- bipedal, small-brain primates -- that arose in Africa from that common ancestor we shared with chimps. But they had been evolving their own way, and then they started to engage in these behaviors that took them into competition with hyenas, the ancestors of lions, other large carnivores -- a very unusual setting for a primate. The evolutionary, natural-selection forces on this organism turned it into a bipedal, tool-using "hyena equivalent," inhabiting the niche of a hyena, and subjected to a lot of interesting and novel evolutionary pressures that I think ultimately led this organism to leave Africa. Indeed, the very first evidence we have outside the African continent comes at 1.8 million years ago, not so long after they started to do this processing of medium- to large-size mammal carcasses in very dangerous environments. This primate, we call it Australopithecus, broke into a different niche, and then it was able to expand its range. Shortly thereafter, by a million years ago, they had spread from the Straits of Gibraltar clear over into China. So a big revolution had occurred in terms of the biogeography of human ancestors. As these new forms were expanding, they were also evolving. The brain sizes were getting larger, and the technologies that we see were becoming more sophisticated. We start to get into what we call the hand-axe culture, which spread all over the Old World, from India clear across to France, and down into the tip of Africa. So it's a very, very different adaptation that occurs at two and a half million [years ago].